Start Studying For The Commercial Drivers License Permit Today! CDLPrepCenter brings you multi part coursework designed to help you study for your Commercial Driver’s License written exam. Getting your CDL permit is the first step to becoming a truck or bus driver. In order to get your permit you have to pass a written test proving you understand the rules of the road for commercial truck drivers as well as some of the technical aspects that come along with driving a truck. Courses are complete with practice CDL test questions and answers similar to the real test to help you prepare. Let these courses help you get your CDL now! The CDL courses and practice tests are easy to use. Don’t waste your time rearranging your life so that you can be available to sit in a boring classroom for hours. Study for your CDL exam at your own pace and save hundreds of dollars on in-person training with cdlprepcenter.com’s affordable study guide option. You can access coursework from anywhere on your computer, tablet or phone. You can study anytime. It’s 100% flexible to your schedule. At the end of every section, there is a practice test that you can review and retake as many times necessary to help you monitor your performance. 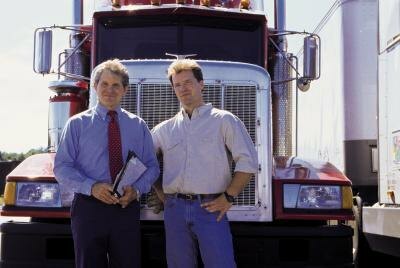 There are additional CDL tests to help you gain test taking confidence. The courses combine all of the important information required to pass the written portion of your CDL exam into a simple, easy to understand format. Don’t waste any more time, the trucking industry is in need of drivers. A lot of companies are offering generous signing bonuses to try to acquire good driving talent. With a CDL permit in hand, it’ll be a lot easier to find a company that will be willing to pay for your on-the-road training and test. Let CDLPrepCenter help make your trucking goals a reality.